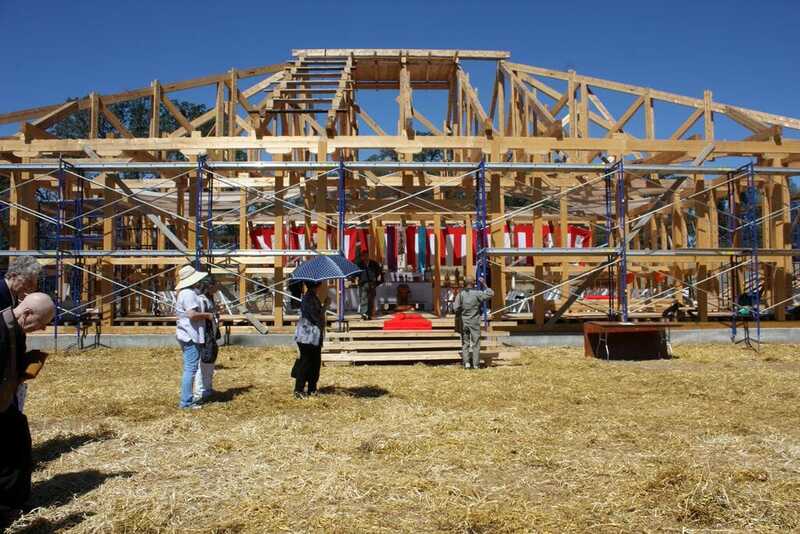 On June 13, on a hundred-acre plot of land not far from wine country in Northern California, priests and supporters from all over the world came together for the framework-raising ceremony of Tenpyozan, which is intended to be the first monastery in the West to offer Zen training of the same style and curriculum as that of traditional monasteries in Japan. About thirty Soto Zen priests from North American sanghas as well as chief officers from head training temples Eiheiji and Sojiji, officials from the Soto Zen administrative headquarters in Tokyo, and representatives from the Soto Zen offices in Europe, South America, and Hawaii, gathered for a framework-raising ceremony and to celebrate the construction, already underway, of what will be the first Sotoshu-recognized training monastery outside Japan. Lay supporters of the project, consultants, architects, and members of the local community joined in chanting for the monastery’s smooth completion and in dedicating the ground as a place of training for future generations. Tenpyozan (the characters mean “Heavenly Peace Mountain”) is the project of Gengo Akiba, abbot of Oakland Zen Center and the head representative of Sotoshu in North America, and Shuyu Togari, abbot of Kichijo-in in Japan. When completed, Tenpyozan will serve as both a year-round monastery for Zen priests in training and a retreat center for laypeople and other interested communities. The buildings, constructed using a mix of traditional carpentry methods and modern techniques, will have all the components of a classic monastery (monks’ hall, Buddha hall, and so on) laid out in a configuration that has been prescribed within the Zen tradition for centuries. Those interested in learning more about the project can visit their website for more details. Very interesting and I hope it works and does well avoiding the issues of the past. For me it is worth remembering that in any century the number of wise 'great' teachers has always been very small the system or religion in Japan has influenced and carried a nation and hopefully influence a nation for many centuries,however we must not interpret that as a nation of 'enlightened people or many people who discover the depths of their meditation. I'm in Japan now, and a more different culture from that of America would be hard to imagine. Everything and everyone is graded, if someone is a year older than you you have to use different forms of the verbs than if they are a year younger than you. Teachers are, of course, infallible (this has nothing to do with "Zen" or Buddhism, by the way, it's hardwired into the language and culture). The idea that anyone would think this was an improvement on the way westerners live, for all its faults, is frankly baffling. How do they plan to run a place like this in America? Will they actually listen to what local people have to say? Anyway, merry Xmas everyone, from Hiroshima. Thanks for posting this, Josh! And great comments, Michael and Tuftsoft! I think that this is a very interesting project. Tempyozan's website is still not up, so we cannot see or read the considerable amount of detail that they have provided about their purpose and trajectory. And, for this reason, it may also not be particularly evident that Tempyozan faced the prospect of complete destruction by wildfire earlier this year. Astonishingly, while some of their property was burned over, some one (or more) Million dollars worth of (donated) precut heavy timber framing--cut in Japan and shipped to their site in California--escaped conflagration. All of this is under the umbrella of Genjo Akiba Roshi, who is the Sotoshu Representative for North America. I have met Genjo Roshi--and, frankly, was struck by a demeanor and a lifestyle that seems to stand in contrast with much of what we have come to associate with traditional Japanese Culture. Forinstance, Genjo's wife, Yoshie Akiba, is the owner of Yoshi's--an enormously successful Japanese Restaurant and Jazz (and R&B) venue in west Oakland. The Tempyozan website (while still down) provides considerable information about a project that describes it's purpose as one that goes far beyond the Japanese Sotoshu--and (apparently) seeks to engage not only Soto Zen practitioners, and not only all Zen practitioners, and not only all Buddhist practitioners--but to provide a potential meeting place for all interested spiritual practitioners, from all traditions, as well. Only time will tell if this is true. Until then, the information for the article above, the Tempyozan website, the Tempyozan Facebook page, and the photos and videos posted there on, have all been provided by Justin Juntoku McCoy. (Justin is a transmitted disciple of Genjo Roshi). Justin is also the on-site coordinator for the construction of Tempyozan. In the small world that we inhabit today, it turns out that Justin is a good friend, and a former EcoDwelling student of mine. (A program that I founded in 2001 at a small private California college). Justin has invited me to be a member of the Tempyozan Advisory Board. I think that we will have to wait a bit to see how this project develops and if it will be a good fit. Good to see they`ve invited you to be on the board Kozan......one of the things they`ve got right so far ! I`m intrigued by this " but to provide a potential meeting place for all interested spiritual practitioners, from all traditions, as well. " intention. That could be difficult in practice for so many reasons. It shows a very open minded attitude however and bodes well for the future. as you said, we shall see. Good luck to the project and thanks for posting these details Kozan.